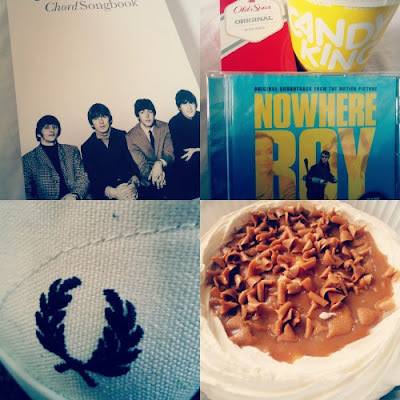 Today was my boyfriend Darren's 19th Birthday, hence the name of this post! We went out to celebrate on Friday night and today we've just stayed in, we were with my Family for Sunday lunch and presents and we're now back at his just chilling! I thought I'd share a few more photos of his day with you all! Incase you're wondering (or are stuck for present ideas for your boyfriend!) the presents I got Darren were some Fred Perry Plimpsoles, a Polo top from Topman (shown in the photo below), Red Dead Redemption for X-box, some red chinos (the ones he's wearing in the photo below! ), Old Spice aftershave, the soundtrack from Nowhere Boy (one of our favourite films!) and some foam banana sweets!